Better reading performance in small areas. The Datalogic Gryphon GFS4100 reader is a state-of-the-art linear imager. It is capable of reading high resolution barcodes up 3 mils. It has outstanding performance on poorly printed or damaged barcodes and a long reading range compared to other scanners in its class. On standard EAN13 or UPC 13 mil barcodes, the Gryphon GFS4100 scanner reads from 3.0 cm / 1.2 in to over 40.0 cm / 15.7 in at extreme skew angles with no degradation of the reading speed. Imagers like the Gryphon GFS4100 can capture data as fast as 320 frames per second, compared to 100 frames per second in laser scanners. Faster processors analyze the data using a sophisticated library of solutions, developed and refined over decades of experience in the industry. 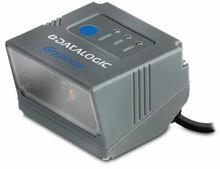 This makes Datalogic's imaging scanners the best solution for speed, accuracy and reliability. The Datalogic GFS4170 is also known as Data Logic	DTL-GFS4170	.